As always, the chemistry between Stephen Amell and Emily Bett Rickards manages to save a lot of dialogue that might otherwise prove insufferable. Despite not being given much screen time as John Diggle coping with the revelation that his wife is doing the same things as the General who framed him in the name of "security", David Ramsey makes the most with what he has and nails it. 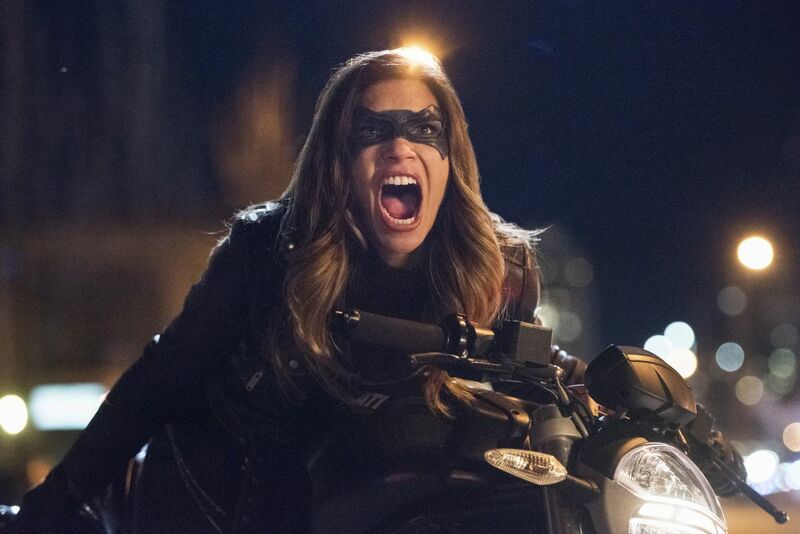 The action sequence with Ollie and Dinah moving to stop the Helix mercenaries from attacking the ARGUS agent is a solid piece of action all-around, with good motorcycle stunts, great FX work for the Canary Cry and a fair bit of fighting. The ending of the episode was honestly surprising. While it was revealed that Wild Dog's daughter is named Zoe in her first appearance, it seems - based on this episode - that Rene's character may have been based, in part, on Floyd Lawton in the 2005 Deadshot mini-series. There, it was revealed that the famous amoral assassin had an illegitimate daughter named Zoe, whom he tried to look after while also staying out of her life, citing his unsuitability to be a good parent. In that mini-series, Lawton confronted Green Arrow and pressured him into doing more to safeguard the Star City neighborhood that Zoe and her mother lived in. The intelligence of Adrian Chase being in New Jersey came from an ARGUS drone, which then broadcast the information to an unsecure phone. This is an unusual breach of security, to say the least, and leads Felicity to conclude that Prometheus has a friend in ARGUS. Psychokenesis and Telekenesis are technical terms for the power to move objects through thought. According to the elevator activity logs, the car Jordan Pierce was in accelerated upward at 9 gs before dropping into a freefall for 40 stories. A polymorphous worm concealed by a kernel rootkit is the signature of Alena's coding.,which allows Felicity to identify her as Jordan Pierce's killer. When he was taken in by ARGUS, Cayden James was at work on a biometric tracker that could recognize individual heartbeats that was powerful enough to scan anywhere in the world. After Damien Darhk took Lyla's security implant, she instituted a new policy at ARGUS that would prevent any sensitive information or location from being accessed by a single person. Access to said information now requires two security keys which are issued only to top ARGUS personnel. They keys are meant to be unhackable, with reprogramming each individual key requiring 24 hours. Alena has a "weaponized tablet" pre-loaded with address resolution protocol spoofing. The ARGUS site is protected by micro-chipped gun turrets. Cayden James' cell is contained behind a grid made of 30-kilowatt spectral beam lasers. Oliver: Might be crossing a line, Felicity. Felicity: Well, you're the last person on Earth who gets to give that lecture, Oliver. Felicity: Or second to last. Felicity: Nice of you to use the front door, for once. Oliver: May I come in, please? Felicity: Uh, actually I was just leaving. Oliver: I can see that. Oliver: Looks like you're not sitting behind a keyboard for this one. Felicity: Can you blame me? Oliver: No. (pauses) I, more than probably anyone else, understand what it's like to be willing to do whatever it takes to stop Chase. Felicity: Then let me do it. Oliver: Let me just tell you how I'm seeing things. (pauses) You're willing to do whatever it takes to stop Chase because I was willing to do whatever it takes to save this city. And that created him. Felicity: (impatient) Okay. So it's ironic. That's what it is. Felicity: Okay! How?! The SCPD tip line? No! That's not going to work this time, Oliver! We both know that! Look, this is our only chance. Oliver: And this is me, asking you...don't do this. Felicity: For the past four years, I have watched you do whatever you had to. Whatever it took to stop the people threatening this city. How can you stand there and not ask me to do the same thing? Oliver: Because... for the past four years you, more than anyone else, have seen the toll that it has taken on me. Felicity: (quietly but firmly) One of the reasons I fell in love with you is because you're always willing to do what was right. No matter what the cost. Even if it's unbearably hard. It's what makes you you. So how can I be any different? You have sacrificed your soul... for the team. For the city. And for me. You don't... have to carry that burden any longer. Let me do it. Oliver: Felicity, I... I can't. Felicity: Then you'll have to stop me. John: That sounds a whole lot like Amanda Waller. Lyla: Waller's decisions seem a lot less wrong from this side of the desk, Johnny. You can't judge me for that. John: I'm not judging. I'm just worried. Felicity Smoak is one of the best people I've ever known and she's gone over to The Dark Side. I don't want that to happen to my wife. Rene: What's so important, Hoss? I was gonna call it a night. Quentin: Hey, your're not the only one around here that doesn't listen to orders. Adrian Chase had a secret hideout set-up in an old arcade in New Jersey. The games inside were booby-trapped with one shooting game fitted with an actual gun that auto-fired after a flash bang grenade was set off. Chase apparently escaped the building through a secret tunnel that led to Port Newark, New Jersey. Felicity, Alena and Curtis were big fans of the video game Maximum Force. Jordan Pierce is the ARGUS agent suspected of working with Adrian Chase. Quentin and Rene meet with the ex-husband of Gay Eked - one of Prometheus' victims in 506. He leaves them her picture. Curtis told Quentin about the situation with Rene's wife dying and his daughter being taken away by CPS, which Curtis learned about in 513. Rene has not taken Curtis up on his offer to get him a lawyer to help argue his custody case, because he is "not ready". Felicity recognizes the code used to hack the elevator that killed Jordan Pierce as having been written by Alena. Alena admits to hacking the elevator but says that the death was accidental. Cayden James is the founder of Helix and reportedly the most skilled hacker in the world. He is so good at covering his tracks not even Felicity has heard of him. He was taken into custody and "vanished" by ARGUS some eight months earlier. Lyla describes him as 20 times more dangerous than Edward Snowden and says that he was picked up trying to hack an ARGUS transponder. Lyla mentions the implant which Damien Darhk stole from her in 420 and how this led to the new security protocols used by ARGUS now. Agent Ditkoff is an ARGUS agent stationed at Port Talbert who is targeted by Helix. Zoe is on the hockey team at her school. She plays goalie. Rene also played goalie when he played hockey. Rene finally does talk to Curtis' lawyer friend and sets things in motion to get his daughter back. Felicity is locked out of Helix but they do give her the tracker program she wanted to find Adrian Chase. Things between John and Lyla are strained, with John saying that he's not sure he can trust her anymore. The episode ends with an explosion rocking The Bunker as Felicity realizes Prometheus is with them. The opening scene takes place at an arcade in New Jersey. Port Talbert - a town 20 miles outside of Star City. Rene describes an incident where he passed out drunk while heating soup for his daughter. She tried to get it off the stove herself, burning herself in the process. It was for that reason that Rene decided not to fight for full custody or to visit his daughter under supervision. He believed she was honestly better off without him. Shockingly dull, for the most part. Much like the Ace Reporter episode of Supergirl - which aired earlier in the same week as this episode - Dangerous Liaisons devotes itself to tiding up some of the season's long-neglected subplots. Unlike that episode, however, it doesn't do that good of a job of it. The sad truth is that Wild Dog is so underdeveloped as a character that it's hard for me to root for him getting his daughter back since most of what we do know about Rene and his past suggests that he's quite right to think his daughter is better off without him in her life. John's issues with Lyla's illegally jailing a man are understandable but seem rather sudden given how little time is devoted to them in this episode. The sudden conflict between Oliver and Felicity is less reasonable but Amell and Rickards sell it on sheer charisma. Despite all these problems, the ending of the episode is a stunner and promises great things next week.